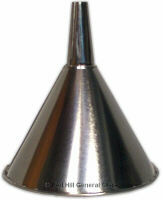 Easy pour, quick drain funnel for the home, farm, shop & automobile. Tin funnels are ideal for general use. This funnel is commonly call a pint funnel but it has a 10 oz capacity.